Why did you write Amy and Phoenix? I love Charlotte’s Web by E.B. White. When I was a classroom teacher, I always enjoyed reading the story to my class of children. I found it such a heart-warming story. I also thought it would be fun to have talking animals, like in the Doctor Doolittle movies. So, initially these two ideas floated around in my imagination and morphed into a modern tale of a girl who wanted to save a disabled lamb on her farm, and her ability to talk to the animals would help her. I took my youngest daughter on a holiday and there was a petting zoo in the caravan park. Each day my daughter wanted to go and feed the animals and pat them. She particularly loved the lambs. The photos of her feeding and patting the animals became cemented in my mind, and they became the characters in the book. My passion is to write stories with disabled characters, or characters in diverse situations. Having a disabled lamb would add a different type of story to my collection. I made Amy’s dad the antagonist. Dad is really just doing what many farmers do. They put down sick or poorly animals. Farmers may feed potty lambs when there is drought, but they don’t normally feed lambs just for the heck of it. They are too busy. Children do not see the world as adults do so I wanted to explore this relationship in the story. The story is about Amy Pringle who sees her dad striding through the loungeroom with his gun. She knows that on the farm that usually isn’t a good thing, and she pursues him to find out why. The bad news is that Amy’s favourite ewe, Edna, has given birth but there is a problem with the lamb. It has three legs. Dad wants to put the lamb down as it will attract the foxes to the farm, but Amy doesn’t want him to. She then has to work out how to change her dad’s mind. With the help of the other farm animals, Amy comes up with a plan which she puts into action. Through a series of events the lambs end up on the internet, and in a talent show. Amy thinks everything is perfect but it soon isn’t. I won’t tell you any more but the story is suspenseful and heart-warming. I have a few. I loved that Amy could talk to the animals but none of the other humans could, and it was like a secret that Amy was keeping from them. And I loved the bond between Amy and Phoenix, particularly when she makes him a crown to wear after she names him. What will people get out of the story? Amy and Phoenix is about a young girl standing up for what she feels is an injustice. Amy is strong and bold, and fights for what she believes in and problem-solves to help her right the wrong she feels her dad is committing. I hope Amy will encourage other children to stand up for what they believe in. The story also has the phenomenon of videos going viral on YouTube, and the media attention this can attract. This part can lead to discussions about cyber safety. Is there a Book 2 coming? Yes, as the story does not end. You will realise that when you reach the last few words of the book. 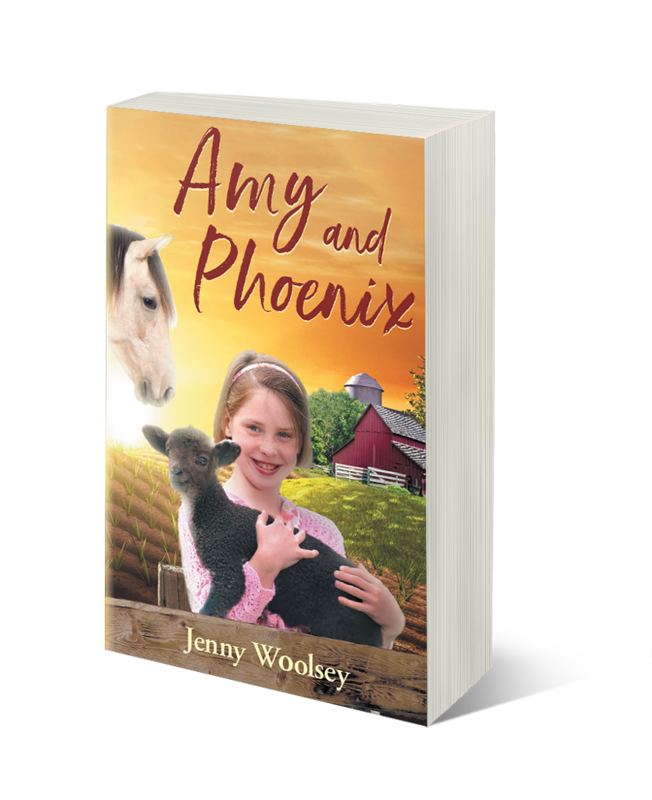 Amy's adventures with Phoenix will be continued in a second novel where she will take the lambs to a TV talent show! I can’t say anything more - you will have to wait and see what happens. Where can people buy Amy and Phoenix from? Amy and Phoenix is available as a paperback. It can be purchased from many online bookstores which are listed on my website, and from me directly, via my website. © 2018 Jenny Woolsey. All rights reserved.